In its 2 short years of existence THE WANDSWORTH VOICE has always stated that it is on the side of all those who live in, work in or merely visit our (sometimes) charming riverside and park-laden borough. Therefore we are committed to espouse, promote and publicise any and all initiatives which seek to enhance the quality of life and the quality of living in Wandsworth. To this end, we wholeheartedly endorse the current initiatives and activities of Wandsworth Living Streets that are being undertaken in conjunction with the Borough’s managers to launch and/or consolidate the ’20mph Speed Limit in Residential Streets’. A borough-wide consultation is now underway and we encourage our legions of local readers and followers to participate in the process. It couldn’t be easier to let your voices be heard. THE WANDSWORTH VOICE has always expressed its desire that all street users – pedestrians, cyclists, motor cyclists, car drivers, truck drivers and public service vehicle drivers – respond intelligently and selflessly to the needs of others. We know of course that this is not always the case – especially with our two-wheeled friends. Accordingly, when no less a person than Sir Bradley Wiggins takes to the media to express his views on the behaviour of some of his fellow cyclists then we salute this admirable Knight of the Road. Our new motto is therefore …. ‘We let the people drive – but just a bit more slowly, please’. 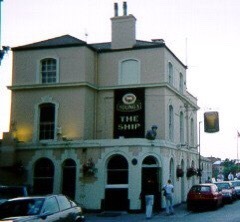 If there’s a pub for all seasons … It’s certainly The Ship. Your commentator remembers it fondly from yesteryear – not quite back to 1796. More like 1976. But times have changed and so has The Ship. Indeed this ship has probably been relaunched more than most other river-going vessels. 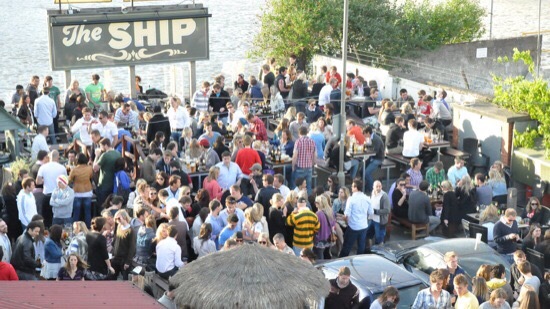 From a tucked-away ale house, hard by a very busy cement and concrete wharf to a locale for the jeunesse dorée of Wandsworth, Battersea and Fulham … that’s what The Ship has become. Maybe it should be called The Chameleon. It caters for Londoners north and south – and (sadly) its weekend success is now reflected in the presence of ‘security’. As your commentator/correspondent would never dream of entering the portals of a bouncer-protected establishment the views that follow are inevitably based on mid-week experiences. When of course it does also ply a healthy trade. Beers are proudly Young’s, food aspires to the current gastro norms … and its great skill is to manage to appeal to a very broad and disparate target group and to maintain their loyalty – whether they imbibe and ingest in the bright main bar or dine in the restaurant or snuggle in the cosy little bar or brave the bracing elements on the open-air terrazza. But let’s stop for just one moment …. here’s a public house right next to a noisy, brightly-lit day-and-night operating Hanson-Heidelberg cement works with its incessant truck movements, with no easy parking, alongside London’s least aesthetically pleasing and currently unilluminated bridge. Long may she sail …. and God bless all those who sail in her.